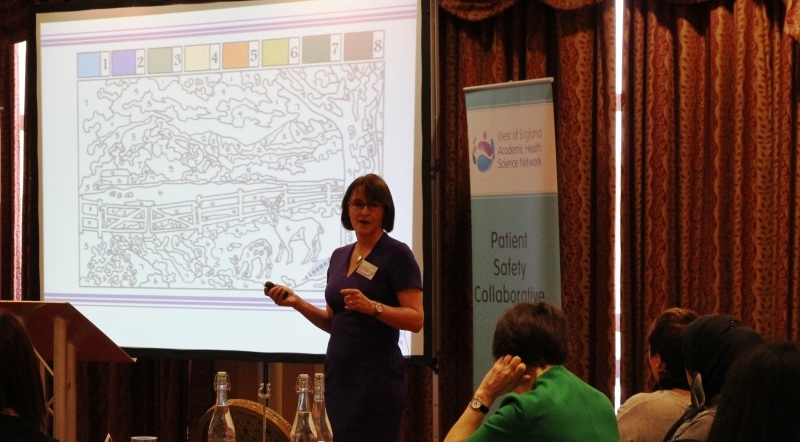 Anne Pullyblank, Clinical Director, West of England Patient Safety Collaborative, looks back at the first year of the Safer Care Through Early Warning Scores programme in the West of England – what’s been achieved so far and what more is to come. We recently held an event in Swindon to celebrate the first anniversary of the Safer Care Through Early Warning Scores programme, led by our West of England Academic Health Science Network (AHSN) Patient Safety Collaborative. We started this exciting programme in March 2015 to adopt the use of early warning scores across our entire health community and have made fantastic progress in a short time. An early warning score (EWS) is an objective measure of how sick a patient is. It is a numerical score based on a full set of observations and we know that EWS is better at detecting a deteriorating patient than clinical review alone. Some hospitals were using the National Early Warning Score (NEWS) and since this was recommended for adoption nationally, our Patient Safety Collaborative, made up of all clinical commissioning groups, NHS trusts and social enterprises in our patch, agreed this was the one we would adopt. In the first year all six acute trusts in the West of England have standardised to NEWS, which on its own is a tremendous achievement. By changing our system response, the vision is to get the sickest patient treated at the right time, in the right place, by a clinician of appropriate seniority. The aim is to use NEWS at every handover of care. Wouldn’t it be great if the NEWScore was communicated along the entire pathway for the acutely unwell patient? Sick patients might be recognised sooner (a colleague of mine compares this to ‘Where’s Wally?’!) and NEWS can trigger earlier recognition and treatment of sepsis. More importantly, by changing our system response, the vision is to get the sickest patient treated at the right time, in the right place, by a clinician of appropriate seniority. If a patient needs to be transferred to hospital, the ambulance response will be quicker for a patient with a raised NEWScore; they will not wait in the ambulance queue and will be reviewed in the emergency department (ED) by a senior clinician. They would then be transferred to the right bed, which could include ITU but would exclude outlying on a non-specialist ward. In order to achieve this we are utilising all the technology available to us. For instance NEWS now features in the new ambulance service electronic patient record and it has been introduced to some GP systems. We are spreading the use of an ED safety checklist, which again includes the use of NEWS. So far we are spreading evidenced-based practice but there are exciting possibilities to help shape the evidence of the future. NEWS has been adopted by our community colleagues, prisons and mental health trusts, helping to escalate the care of sick patients between health providers. NEWS has not been validated for detecting the deteriorating patient in the community setting, so there is huge excitement around the possibility of using a baseline for patients with long-term conditions, using NEWS at end of life or as a decision aid for admission avoidance. We are collaborating with researchers to systematically evaluate our work. The next step for the WEAHSN is to link innovation to practice. There are gadgets that can take observations and communicate wirelessly to electronic devices. There is an app to calculate the NEWS score and we are working with industry to enable easy calculation of a NEWScore in the community and in patients’ own homes. If we can link this to electronic systems that talk to each other, then that would be real progress! We are also working with third sector and carers organisations because for patients with long term conditions, asking about a NEWScore when unwell will empower patients and carers to raise concerns. We are making progress faster than expected with this project. This is because people believe in it. The work is happening not because of a government diktat or because we are being paid to do it, but because dedicated people across a health system believe this will make patient care safer. The objective is to reduce mortality from sepsis, rescue acutely unwell patients and ultimately treat some patients at home appropriately leading to admission avoidance. Having the right patient treated at the right time, in the right place, by the right person will improve flow across the system – saving money, bed days and most importantly lives. To find out more about the roll-out of NEWS in the West of England visit www.weahsn.net/NEWS or email Ellie Wetz Patient Safety Improvement Lead at ellie.wetz@weahsn.net.